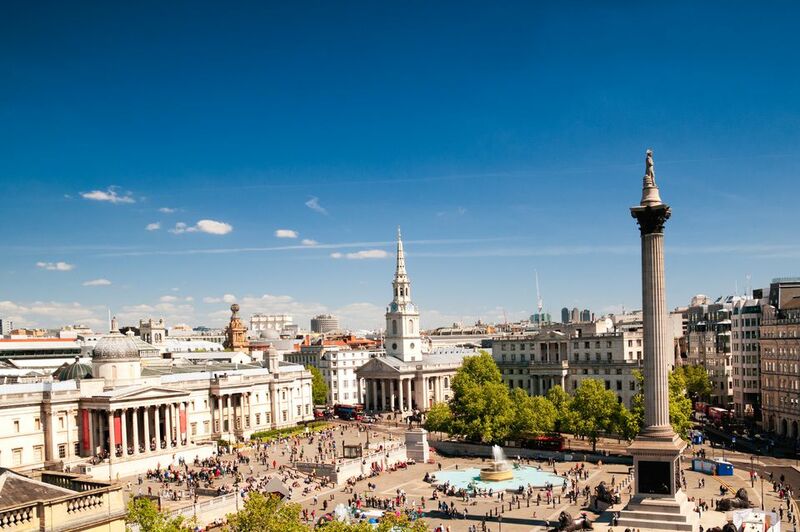 Located at the beating heart of Central London and named after Lord Nelson's victory over the French and Spanish at the Battle of Trafalgar, Trafalgar Square has been a gathering place for tourists and locals since 1844. There is much to see — from Nelson's Column, guarded by four bronze lions; to the Fourth Plinth, occupied by a changing roster of provocative contemporary sculptures. Trafalgar Square is also home to the National Gallery. If you find yourself feeling peckish, there are countless restaurants within a few minutes' walk. In this article, we look at 10 of the best. Can't tear yourself away from the hustle and bustle of Trafalgar? Make your way to Café on the Square, located at the bottom of the central staircase that connects the plaza to the National Gallery at the top. Outdoor chairs and tables are great for people-watching and catching a tan in summer, while the menu offers traditional British café fare. Expect homemade sandwiches and cakes, and cream teas in season. The café is open every day from 9 a.m. to 6 p.m. in summer, and from 10 a.m. to 5 p.m. in winter. The Admiralty pub overlooks Nelson's Column and pays tribute to his flagship, the HMS Victory, with its wood panelling and vintage nautical decor. It's also London's most central pub. The Admiralty is owned by Fuller's Brewery and carries their best cask ales on tap. Order a pint of London Pride and pair it with traditional fish and chips or a hand-crafted pie. If you can't decide on a flavor, opt for a pie and ale tasting board. Open from 9 a.m. every day (10 a.m. on Sundays), the pub also serves full English breakfasts. A two-minute walk from Trafalgar Square takes you to 18th-century church St. Martin-in-the-Fields. Underneath the church lies Café in the Crypt, a true London gem complete with original vaulted brick ceilings and tombstones built into the floor. The food is served buffet style and prepared with sustainable, British and Fairtrade ingredients. In addition to being tasty, it's also great value for money and proceeds go towards the upkeep of the church. Café in the Crypt is open from 10 a.m. every day except Sunday, when it opens at 11 a.m.
A three-minute walk away, Covent Garden restaurant Tandoor Chop House receives rave reviews from diners and food critics. Part British chop house and part North Indian communal eatery, it serves mouthwatering meat cuts prepared with Indian spices and marinades in traditional tandoor ovens. Share small plates with your friends, eat with your fingers and order seconds of specialties like chickpea and beef kheema. The restaurant is open from midday until late, Monday to Saturday. On Sunday it's open from 1 p.m. to 10 p.m.
For a sophisticated celebration meal, consider Portrait Restaurant & Bar, located on the top floor of the National Portrait Gallery. The restaurant is known for the quality of its fine British cuisine, with specials including pheasant and South Coast sole. Large windows afford breathtaking views of iconic London landmarks like Nelson's Column, the Houses of Parliament and the London Eye. Come for brunch or afternoon tea; or for a pre-theater dinner before heading into the West End on Thursdays, Fridays and Saturdays. Rules was established in 1798 and is the oldest restaurant in London. Decorated in red and gold, its walls are adorned with drawings, paintings and cartoons from its storied past. Many stars of stage and screen have dined here, including Laurence Olivier, Clark Gable and Charlie Chaplin. For over 200 years, Rules has specialized in oysters, pies and puddings and also offers classic game dishes sourced from its own estate in the High Pennines. Its Covent Garden address is a seven-minute walk from Trafalgar Square. In the mood for something Spanish? Head to Barrafina on Adelaide Street. The closest of four London locations, this restaurant is an easy four-minute walk away. Guests sit on red leather stools at the marble-topped bar and watch chefs prepare authentic tapas in an open kitchen. Pair your choices with a glass (or two) of Spanish wine, Cava or sherry. Barrafina is open daily for lunch and dinner and can accommodate groups of up to four people. It's walk-in only, so be prepared to wait for a place at the bar. Located in between the National Portrait Gallery and Leicester Square, independent Vespa Italian Restaurant is a three-minute walk away. With its exposed brick walls and friendly wait staff, it's a welcome departure from the pizza chains that dominate Central London. The menu features artisan pizzas, creamy risottos and fresh pastas. In summer, pretend you're in Florence and sip aperitifs at one of the pavement tables. The restaurant is open from midday to 11 p.m. every day except Sunday, when it closes an hour earlier. Add a touch of Parisian chic to your Trafalgar experience with a visit to B Bakery, located five minutes away. Order macarons, cupcakes, tarts and pastries from the mouthwatering display; or call 24 hours in advance to arrange a traditional afternoon tea. The bakery also caters to vegan, vegetarian, halal and gluten-free visitors. Alternatively, continue sightseeing on one of the bakery's Afternoon Tea Bus Tours. View famous attractions like Big Ben and Westminster Abbey while sipping tea aboard a vintage double decker bus. For delicious noodles, take a six-minute walk to the Panton Street branch of Kanada-Ya. This Japanese chain specializes in tonkotsu ramen but also serves authentic rice dishes and small plates. There's a special menu for kids and an allergen menu that shows visitors with dietary requirements what they can and can't eat with a single glance. Wash your meal down with chilled or hot sake or choose from a menu of Japanese whiskies and beers. Kanada-Ya also has branches in Covent Garden and Angel.